Cue the spotlight: from flower girl tutus to ballerina flats, we're sharing some of the prettiest ballet-inspired wedding ideas ever. Ballet is one of the most romanticized dance styles (the pointe shoes! the costumes! the music! 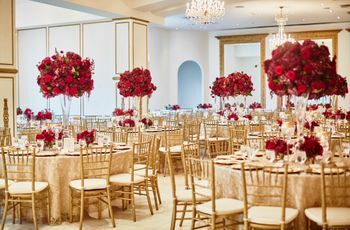 ), so it's no surprise to see that couples are catching on to this beautifully timeless art form as inspiration for their wedding days. 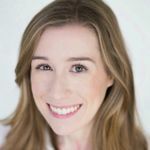 Planning a ballet-inspired wedding isn't just for dancers, although if you are one, it's an excellent way to showcase your passion and personality on the big day. But even if you're simply an admirer wishing to be a ballerina, you can incorporate details from this elegant aesthetic into your wedding. Ballet wedding style is all about soft and floaty fabrics, sophisticated elements, and of course plenty of blush pink and tulle. It's utterly classic and graceful, with an air of whimsy. See our favorite ideas for a ballet-inspired wedding below. 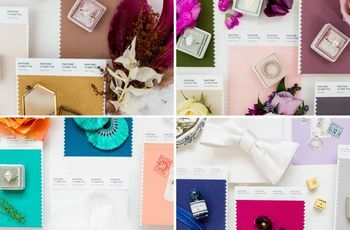 Capture the elegance and softness of ballerina style with a blush watercolor stationery suite. Whimsical black calligraphy adds just the right amount of playfulness and contrast. 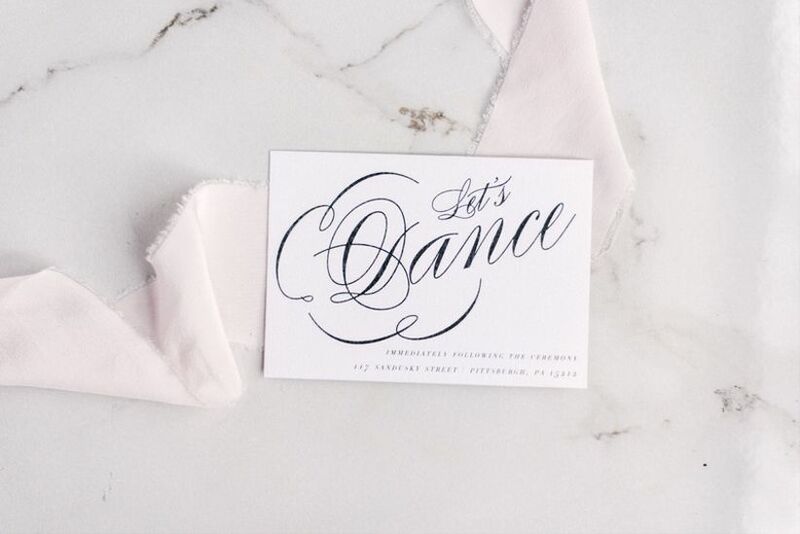 What better way to get everyone excited for the big day than with a dance-themed reception card to match your wedding invitations? Include a fun phrase like "Let's Dance" along with the reception venue address and other important details. 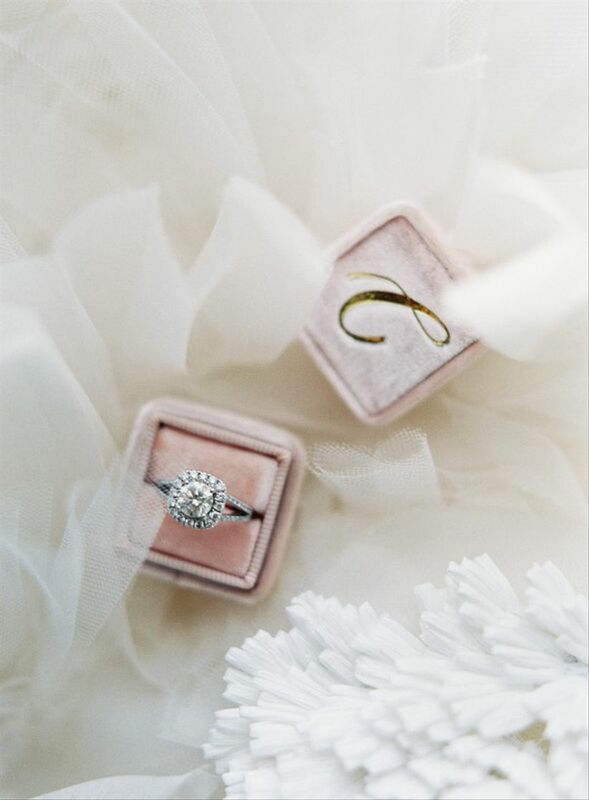 When that sparkler isn't on your finger, keep it safe in a soft blush velvet ring box. A monogrammed style adds extra personalization. 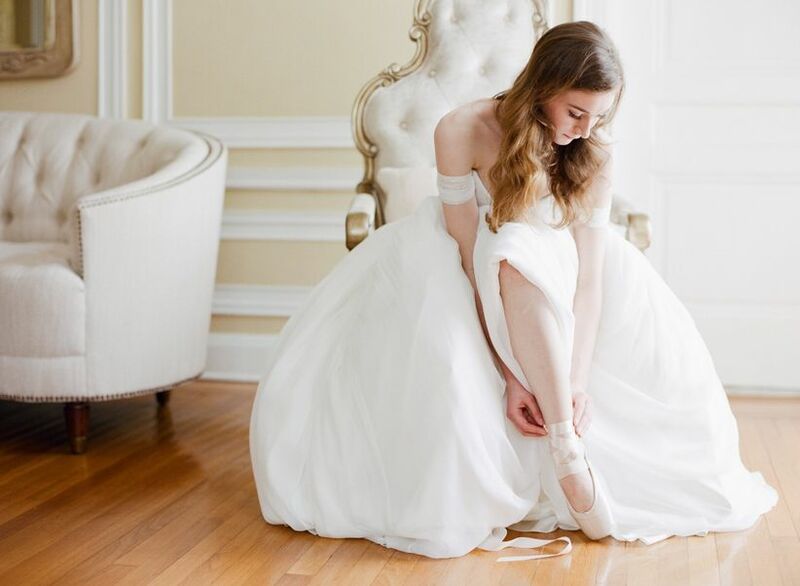 Even if you don't wear them down the aisle, your pointe shoes are a great way to showcase your dancing skills on the big day. We love the idea of putting them on with your wedding dress and twirling around for a few bridal portraits. Treat your bridal party to matching flats so their feet stay comfortable all day long. This style pairs perfectly with wrap dresses and floaty fabrics like chiffon and organza. Every ballerina has to take off her pointe shoes sooner or later! 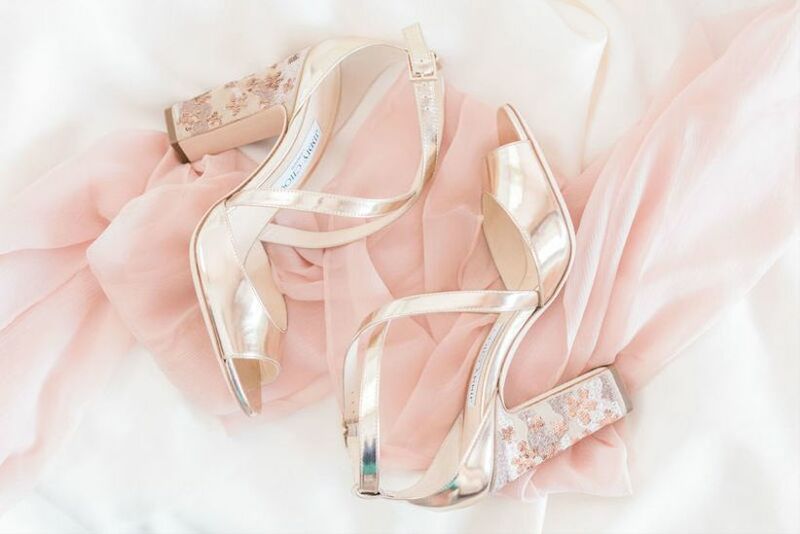 Swap your ballet slippers for a pretty pair of high heels in a pastel color with wraparound straps. 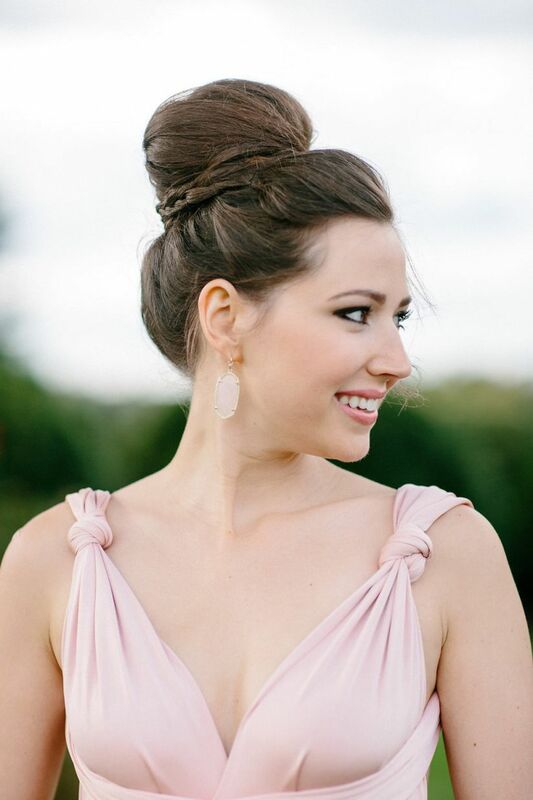 Keep your tresses tamed and out of the way by wearing your hair in a ballet-inspired bun. This gorgeous topknot is accented with a few baby braids wrapped around the base for extra oomph. Once your hair is up, you can show off a fun pair of earrings! Go for an ethereal bridal look with barely-there makeup that embraces dewy, glowing skin. A cream blush blends seamlessly into your cheeks, creating a natural pink flush that's effortless and elegant. Carry a free-flowing bouquet filled with loose flowers and vines that reflect the fluid movements of a ballet performance. 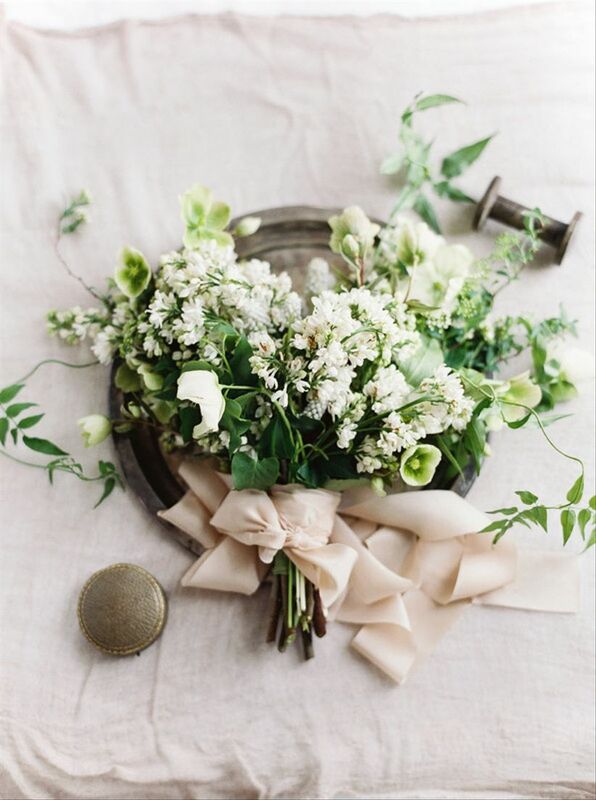 Long blush ribbons tied in a bow are the pièce de résistance on this bouquet of hellebores, white lilacs, muscari, and greenery. It wouldn't be a ballet-inspired wedding without at least one tutu! 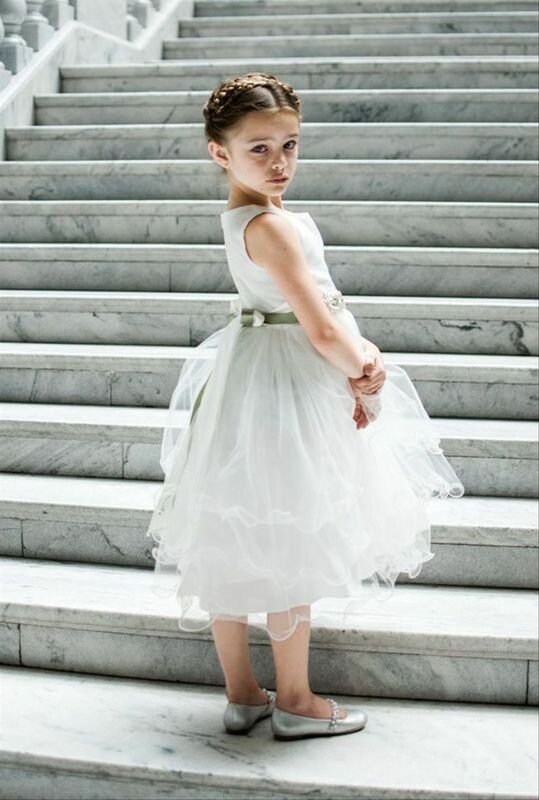 We totally support rocking a tutu on your wedding day if that's your style, but if not, your flower girl is sure to look adorable in a ballerina-style dress. For a modern (and ultra-chic) twist on the ballet wedding theme, opt for a more minimal dress with off-the-shoulder sleeves. This drool-worthy style by Pas de Deux Bridal is actually a top and skirt! Choose a wedding dress made with lightweight fabric that moves easily in case you feel the need to break out a pirouette turn or two. Dresses with capelets and flutter sleeves are especially beautiful options. Of course for the ultimate ballerina wedding dress, you can't go wrong with lots and lots of tulle. A blush and mauve style is incredibly romantic while still giving you that ballet-inspired look. 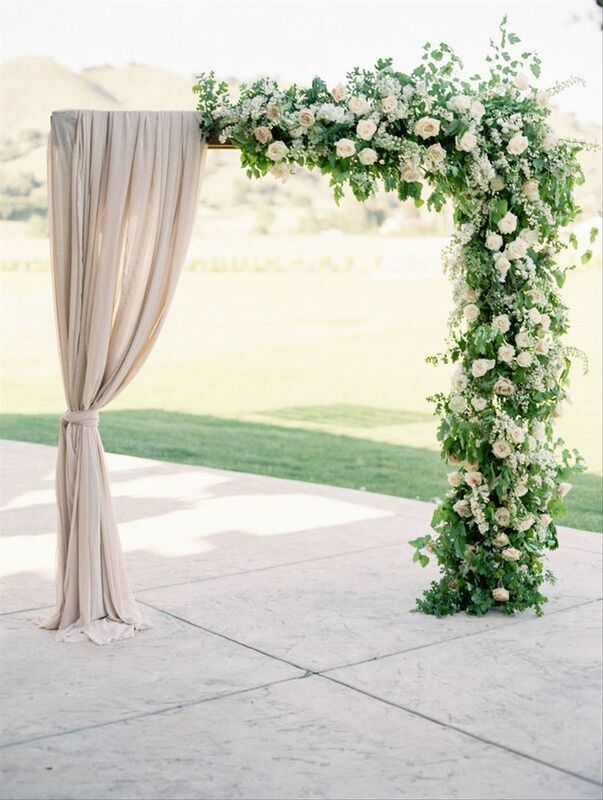 We're obsessing over this fresh take on the popular floral ceremony backdrop. 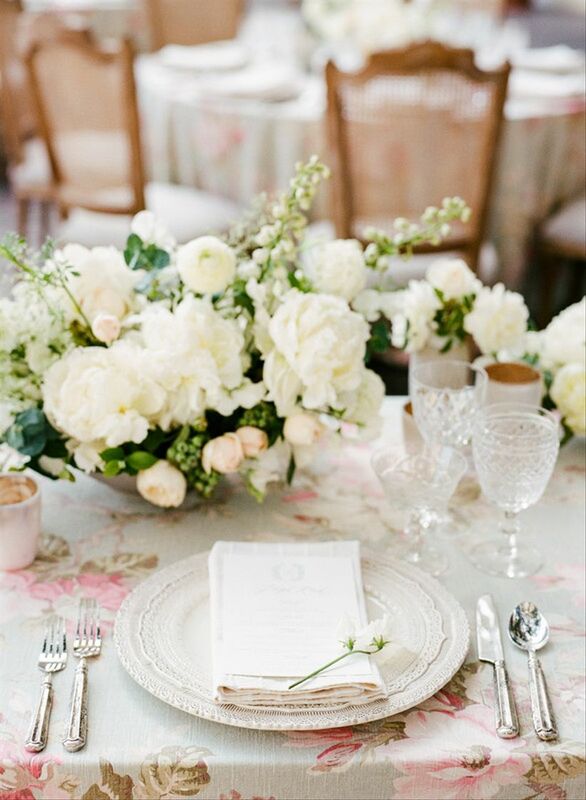 Drape fabric just off-center next to lush florals for an unexpected and totally pin-worthy effect. 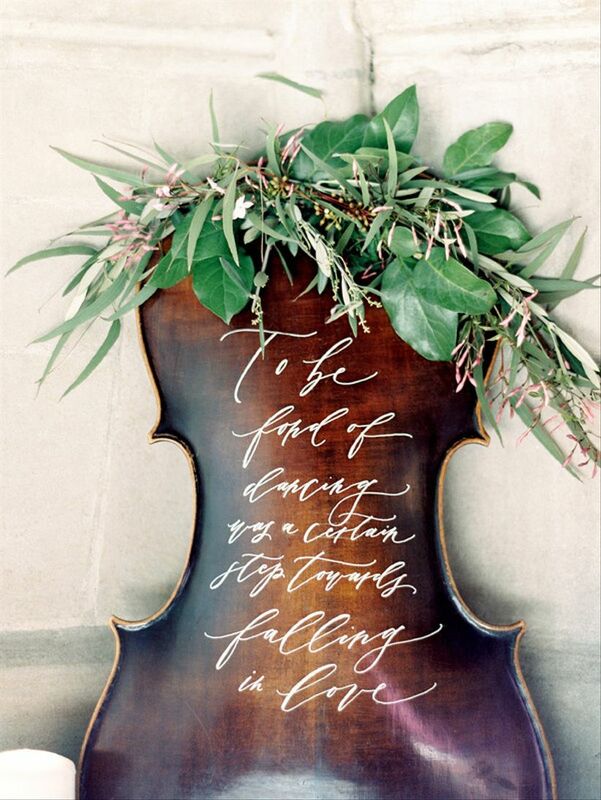 If you love classical music, this unique sign idea is perfect for a ballet-inspired wedding. No need to worry about ruining a good violin or cello — look at secondhand music stores or flea markets for a broken string instrument that you can repurpose instead. 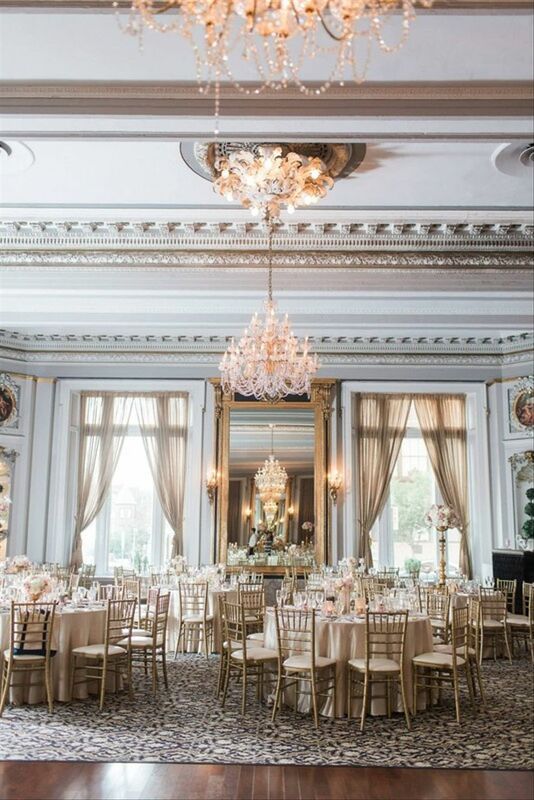 A historic venue with ornate features is one of our favorite backdrops for a ballet wedding. Look for a ballroom or mansion that's filled with character, like antique chandeliers, dark wood floors, tall ceilings, and crown molding. The best part is that you won't need as much decor at a venue like this, since it's already beautiful as is. 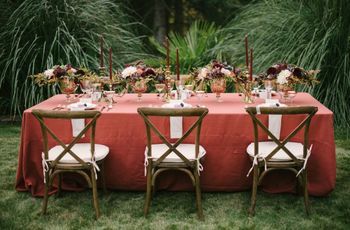 Decorate your banquet tables with elegantly patterned linens while keeping the rest of the tabletop decor, like the place settings and centerpieces, simple with a neutral color palette. 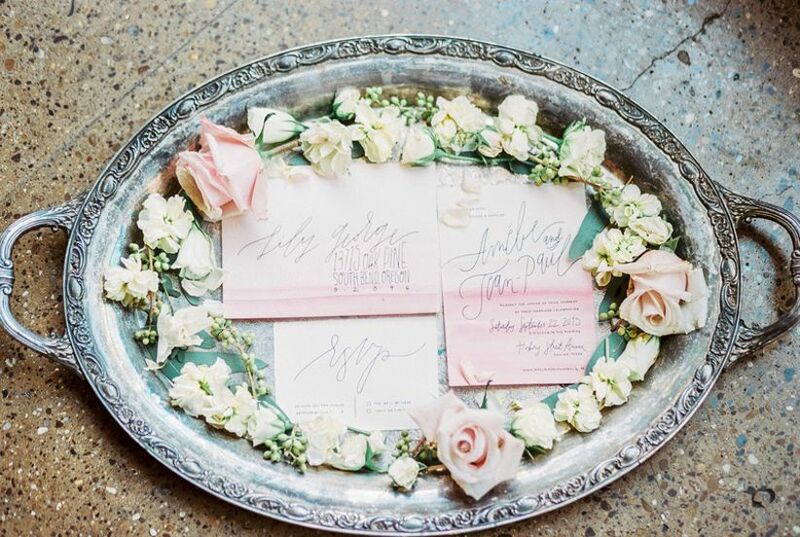 This vintage-inspired floral motif is sophisticated and oh-so-feminine. 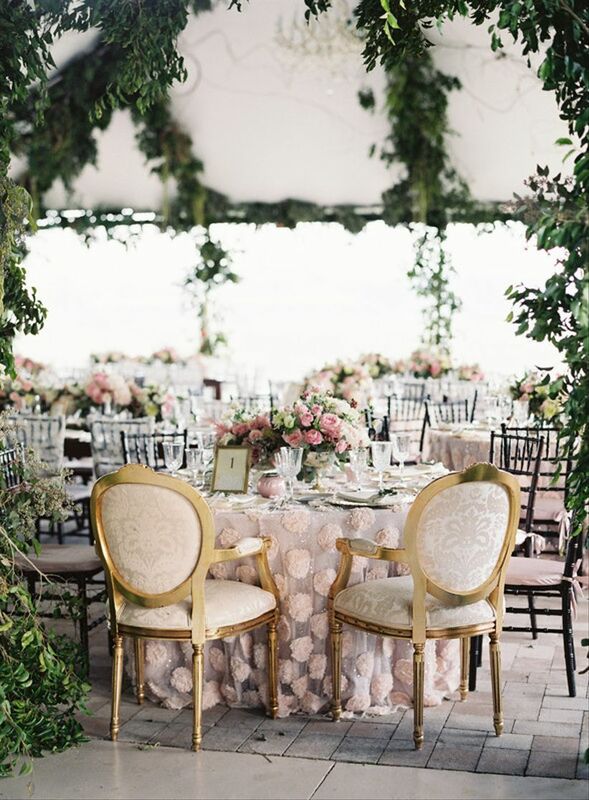 A hint of gold is exactly what every ballet-inspired or modern blush wedding needs. 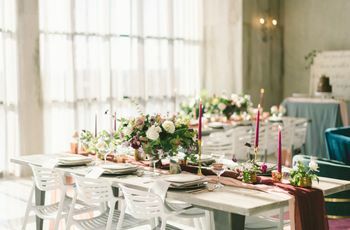 Dine in style with gold antique chairs for you and your S.O., or incorporate gold through the use of candlesticks, chargers, and centerpiece vessels. 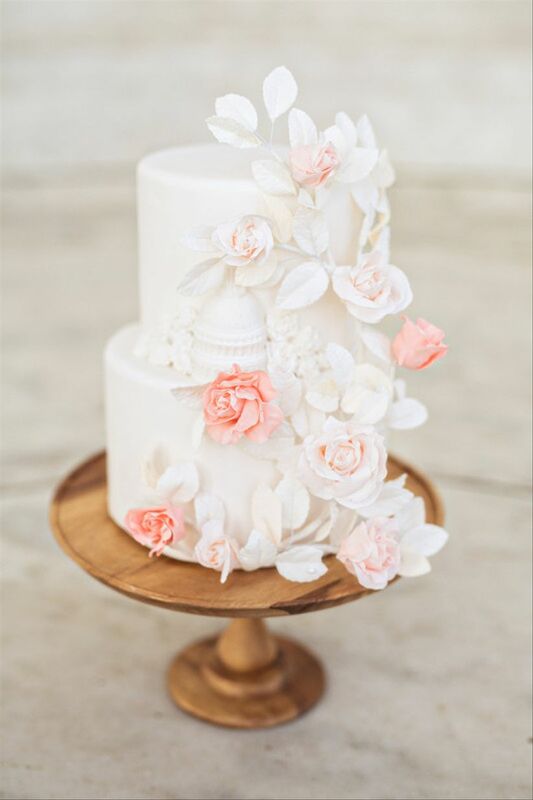 We're suckers for almost any kind of floral wedding cake, but this three-dimensional confection is *kind of* taking our breath away. How amazing are these sugar flowers cascading down the side? 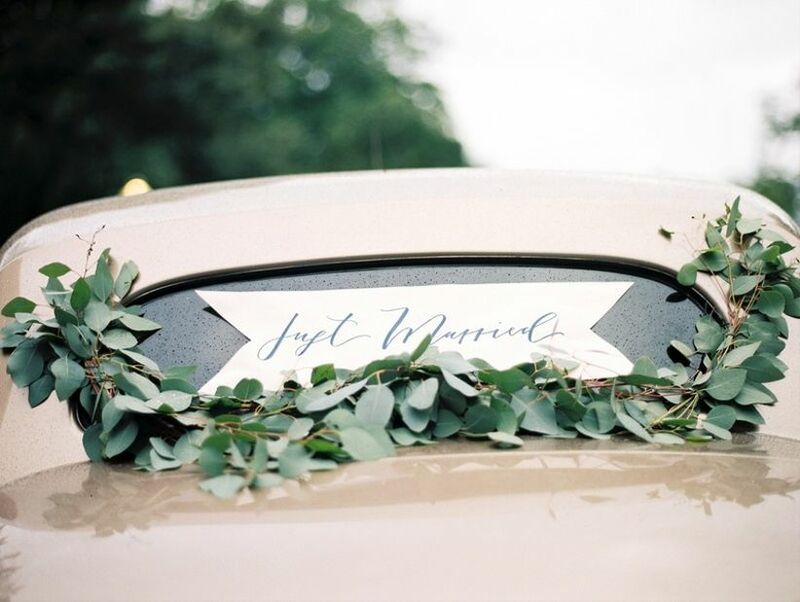 At the end of the wedding, take your final bow and then make your grand exit in a vintage getaway car decorated with fresh eucalyptus and a "Just Married" sign.